Yoga Teacher Training India | School of Santhi Yoga Teacher Training Kerala, South India. International Yoga Teacher Certification. TTC 200. TTC 500. TTC 900. Traditional Yoga School in India. Authorized by the Indian Government. Yoga TTC 200 in India, include 302 hours of Yoga study. 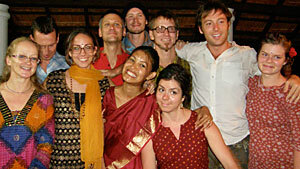 Level 1 in India is the first part of our 900 hour certified Yoga Teacher Training program. The main teacher in India is still Swami Santhiprasad assisted by his Indian Yoga Masters Kannan, Devendran and other assisting teachers. After successfully completing this course you will also become Yoga Parichaya, Yoga Teacher Assistant and will receive School of Santhi International Yoga Teacher Certificate TTC 300 hours. If you have a serious interest in learning traditional Yoga directly from a Spiritual Yoga Master, if you accept to follow our student rules, if you accept to study hard to complete the course program and if you do respect the manners and life style in India - then you are most welcome to apply for the first level of our Yoga Teacher Training program. TTC 500-I in India, the second part of our 800 or 900 hour certified Yoga Teacher Training program. our Yoga TTC level 1 (200 hours in Sweden or 302 hours in India). 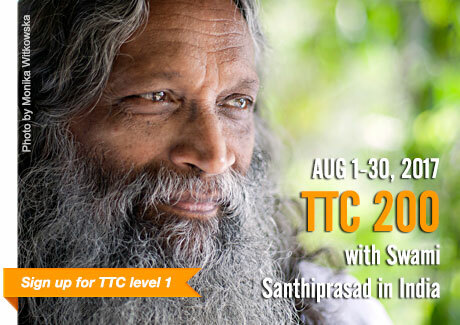 Students successfully completing level 2 will receive School of Santhi International Yoga Teacher Certificate TTC 500-I. Please contact school administration for more information about the next course. TTC 500-II in India is the last part of our 800 or 900 hour certified Yoga Teacher Training program. Students successfully completing level 3 will receive School of Santhi International Yoga Teacher Certificate TTC 500-II. Please make your reservation in time! Consider the time it will take to get an Indian Student Visa! into meditation or speaks about Kundalini Yoga, Raja Yoga, Siva Raja Yoga, Swara Yoga, Bhakti Yoga, Hatha Yoga, Tantra Yoga, Karma Yoga or in any other subject you will certainly feel the flow of love and devotion from a true spiritual Yoga Master. in the spiritual way according to the Indian Gurukula System following the eight limbs of Yoga described by Sage Patanjali in his Yoga Sutras. The salient feature of this age-old system is the total involvement of the Yoga Master in imparting knowledge to his disciples in an atmosphere of love and compassion. This is being done in small groups at School of Santhi Yoga Teacher Training in India and Europe. 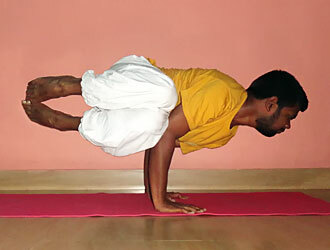 in three levels including totally 900 hours of Yoga study of which 500 hours are training in Yoga Asana. Our aim is to mend professional Yoga Teachers and Yoga Instructors in 2 - 3 years time with in-depth knowledge in the Science of Yoga. Swami Santhiprasad's Yoga Teacher Training program include Pranayama, withdrawal of senses, concentration, meditation and integration practices. The study of Kundalini Yoga, Swara Yoga, Jnana Yoga, Karma Yoga, Bhakti Yoga and Vedic Mantra chanting form part of the program. Besides this, human anatomy and physiology are also being taught for a better understanding of Yoga and its profound influence in the transformation of human body and spirit. Santhi's Yoga Teacher Training in India, a 900 hours educational program in 3 levels to mend professional Yoga Teachers and Yoga Instructors in 2 - 3 years time with in-depth knowledge in the Science of Yoga and in how to teach Yoga. Registered Yoga School by Yoga Alliance USA at level TTC 200 hours and TTC 500 hours. TTC 200 hours and TTC 500 hours. School of Santhi Yoga Teacher Training Education follow higher standards than the minimum standards set by International Yoga Federation and Yoga Alliance in all our Yoga Teacher Training programs. The minimum standards for Yoga Teacher Training Schools set by International Yoga Federation is followed by most newer national Yoga Alliances such as: Yoga Alliance USA, Yoga Alliance UK, Yoga Alliance Mexico, Yoga Alliance Canada, Yoga Alliance India, Australian Yoga Association, European Yoga Federation, South American Yoga Federations and International Yoga Alliance etc. Registered Yoga Schools following the set standards for Yoga Teacher Training will guarantee a high standard of the education and provide experienced Yoga Teachers with deep knowledge in the Science of Yoga. Like us, many other Yoga Schools, who seriously train their students to become professional Yoga teachers, have higher Yoga Teacher Training standards in their programs than what is recommended. At School of Santhi Yoga Teacher Training School in India, our Spiritual leader, Yoga Master and Yoga Guru, Swami Santhiprasad passes on his knowledge in Spiritual Yoga which is based on Siva Raja Yoga. Siva Raja Yoga is an ancient Yogic system following the eight limbs of Yoga, described by Sage Patanjali in his Yoga Sutras, together with advanced Yoga practices combined with Pranayama. 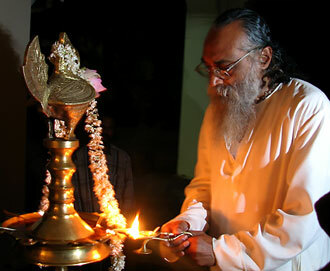 Swami Santhiprasad's Yoga Teacher Training program include studies in Siva Raja Yoga, Samkhya Yoga, Jnana Yoga, Kundalini Yoga, Swara Yoga and Hatha Yoga. program you will be able to take part of the deep knowledge and wisdom from Swami Santhiprasad's over 50 years experience of Yoga. 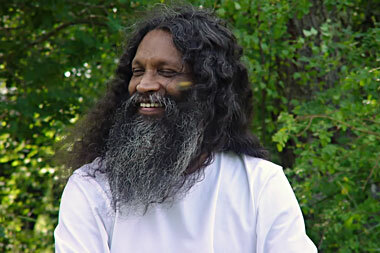 has been passed on to him traditionally from Yoga Master to disciple according to the Indian Gurukula System. Swami Santhiprasad's has learnt Yoga by experience from practicing and teaching Yoga over 50 years. He is our Spiritual leader, Yoga Master and Yoga Guru and are able to handle all questions you may have during Yoga classes whatever level of Yoga you study. 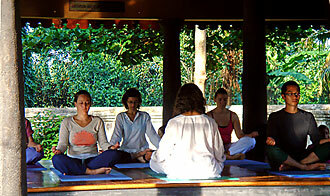 of Yoga and of the Yogic traditions ensures the quality of our Yoga Teacher Training program. include Pranayama, withdrawal of senses, concentration, meditation and integration practices. The study of Kundalini Yoga Swara Yoga, Jnana Yoga, Karma Yoga, Bhakti Yoga, Hatha Yoga and Vedic Mantra chanting form part of the program. Besides this, human anatomy and physiology are also being taught for a better understanding of Yoga and its profound influence in the transformation of human body and spirit. at School of Santhi Yoga Teacher Training School in India, below demonstrating the advanced Yoga posture "Ananthasayana eka pada sirasana" for our Yoga Teacher Training students in course level 3, TTC 500-part II, during Asana class in India. at School of Santhi Yoga Teacher Training School in India below demonstrating the advanced Yoga posture "Parsva Bakasana" for our Yoga Teacher Training students in course level 3, TTC 500-part II, during Asana class in India. also this Royal Yoga path employs higher techniques of Asanas, Pranayama, Bandha, Kriyas and Mudras. The traditional Yoga Master and disciple system. Our endeavour is to seriously guide the student on the spiritual path of Yoga, the science of body, mind and soul in the traditional Gurukula system prevalent in India long ago. The culmination, you will get to know the real you in you. Our Yoga programs are perfectly suited to serious spiritual Yoga seekers, not for tourists looking for comfort, pleasure and entertainment. The experience provides immense joy of knowing. Just as envisaged in the traditional Indian Gurukula System, personal attention is ensured to each student and to facilitate this our sessions are conducted in small Yoga groups. 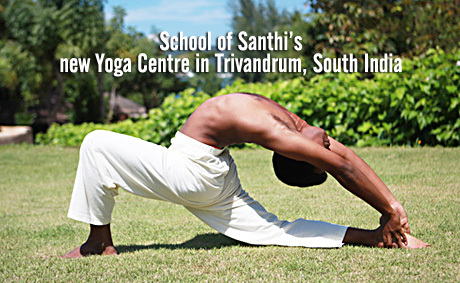 School of Santhi Yoga School in india is open to all Yoga students, both Indian and international. Yoga students interested in learning classical yoga in the traditional way directly from the spiritual Yoga Master will definitely be benefited. 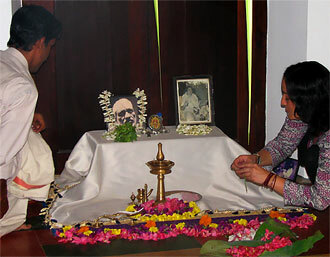 In the present social and cultural backdrop, the traditional and eternal knowledge of spirituality is imparted in an inimitable and easily comprehensible method, designed and successfully experimented by the School of Santhi Yoga School in India, through English and Malayalam, the local language. into Meditation or speaks about Kundalini Yoga, Raja Yoga, Siva Raja Yoga, Jnana Yoga, Bhakti Yoga, Swara Yoga, Tantra Yoga, Karma Yoga, Prana or reveal the deeper and truer aspects of the Chakra natures, when he explains the Yoga Sutras of Patanjali or gives you practical guidance in proper breathing, Pranayama or Yoga Asanas, it is a flow of love and devotion from a Spiritual Yoga Master. "Love is the source and is in every one of us". Santhi addresses to the spirit of the heart, not only to the mind. You are most welcome to participate in our Spiritual Yoga programs at School of Santhi Yoga Teacher Training School in India and Europe! me confidence and a professional manner of teaching.